A Liberal's Libretto: Wait ... Mozart died from what? Wait ... Mozart died from what? We've all seen the 1984 film adaptation of the life of W.A. Mozart - Amadeus. In it, we are led to believe that perhaps Mozart died at the hands of his rival Antonio Salieri while finishing his Requiem. Amadeus isn't the only way in which we have the opportunity to see this story. Alexander Pushkin wrote a play about it, Mozart and Salieri, and the composer Nikolai Rimsky-Korsakov adapted it into an opera of the same name. Since the Austrian composer died in December 1791, Mozart’s cause of death has continued to be a mystery. According to his sister-in-law, Sophie Haibel, his body was so swollen that he couldn’t turn in bed, and he remained rational until the end. These symptoms are consistent with kidney failure which is often times brought on by infections. Now, some 218 years later, Mozart's cause of death is far less mysterious: Strep Throat. According to Bloomberg.com, a minor streptococcus epidemic had erupted when Mozart died in 18th century Vienna. 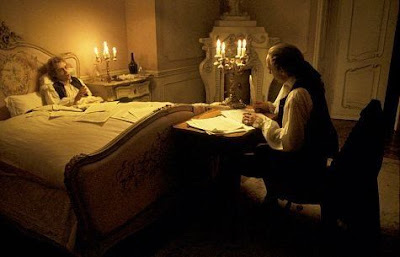 According to research published in the Annals of Internal Medicine, the scientists hypothesize that strep probably caused his death by analyzing the local death records for the winter of 1791 and the years before and after. Other theories on Mozart’s death have included rheumatic fever and trichinosis which is caused by undercooked pork, the authors of the study wrote. Unless new information comes to light, this may be the strongest hypothesis for the composer’s death, said Richard H.C. Zegers, an ophthalmologist at the University of Amsterdam in the Netherlands. There is something so odd about one of the greatest minds of all time being stilled by something that, today, is so treatable.